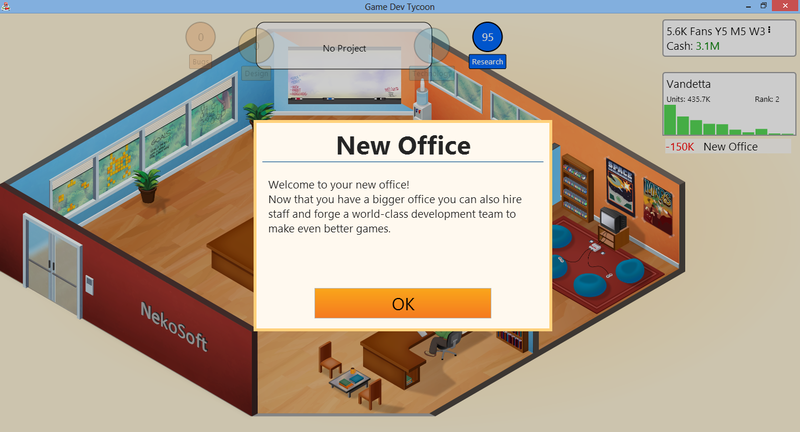 So I've recently bought this indie game called Game Dev Tycoon. If you know the game 'Game Dev Story' on Android and iOS; it is pretty much the same type of gameplay but slightly better (and on the PC!). If you don't what I'm talking about, let me explain the game in a few sentences. Basically, this game is a 'game company simulation game'. You start of as a unknown indie developer in his garage pumping out self-made games. 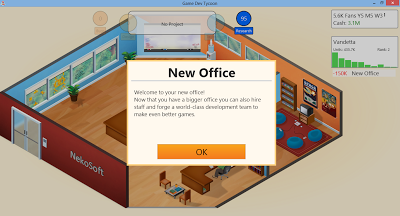 From those games, you generate some profit to research additional topics or game engine enhancements to levelling up to a new office and managing staff. The game isn't so simple as you think. You have to manage your money wisely and each action you take costs cash whether it is to hire new staff, train them, or developing a new game. Also, the rent each month is quite demanding, so you can't just go on a spending spree to get the best at a very early stage. Anyhow, the game is $7.99 for Windows, Mac and Linux over at Greenheart Games. I would recommend this game to anyone who is into simulation games. You may find this game interesting, fun, addictive and quite informative. There is so much flexibility in what you can do in the game. Also, don't even think about pirating the game, because you will just get locked out in an anti-piracy easter egg that's hidden within the game.